This video shows you the steps for getting started on SimplePay, which can also be read below. This article will walk you through the basics of signing up for SimplePay, setting up your company and doing your first pay run. Click on a section header to jump ahead on this page. All other links on this page will open in a new tab, which will make it easier to keep following along on this page. If you haven’t yet registered as a SimplePay user, we would like to invite you to sign up here for a no-obligation, free, 30 day trial without delay. When you first log in, you will see a message notifying you that you are working with a Demo Company and giving you a link to create your own. The Demo Company comes pre-populated with dummy employees that you can use to play around on the system. However, as you have full access to the system during the trial period, we recommend setting up your own company from the start so that you can begin processing your actual payroll immediately. You are, of course, welcome to work with the Demo Company initially if you prefer. Adding a company is a simple 3 step process. The steps are the same regardless of when you decide to add a company to SimplePay – initially, when you’ve signed up for a free trial or later on, when you want to add companies to your profile. If you click on an employee’s name when you are in the Employees tab, you will see the screen where you generate their payslips. Once you have finalised all of your payslips, you will need to create a pay run. Pay runs are a means of grouping payslips; they are purely for convenience and do not affect any payslip data in any way. 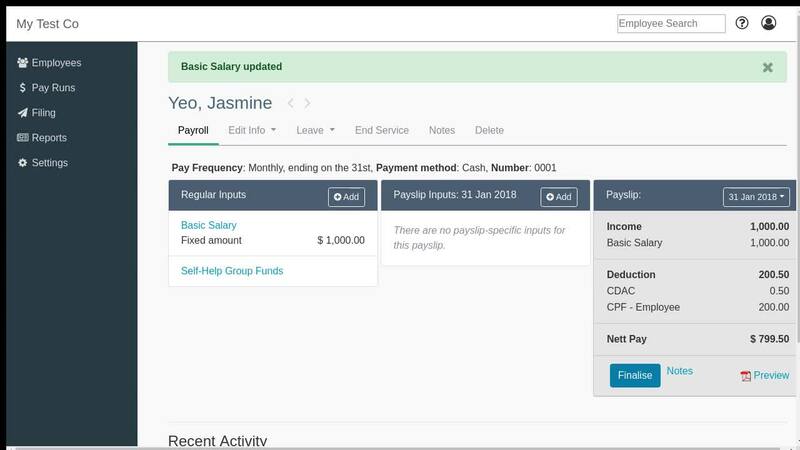 Creating a pay run allows you to print payslips in bulk, post to Xero (if you have set up the integration), download GIRO files and send payslips to Self-Service (discussed below). Creating a pay run is simple – click on Pay Runs and then Create Pay Run for the relevant period. That’s it! You are able to download and email or print your employees’ payslips from the system by default; however, there is another option also – Employee Self-Service. This allows you to create accounts for your employees, which they can use to log in to SimplePay and view their payslips. Once you have set up your employees for self-service, you will be prompted to release the payslips when creating pay runs. If you only set up self-service after creating previous pay runs, any payslips that are part of a pay run will automatically be released once your self-service settings are saved. Based on your finalised payslips, SimplePay automatically generates the documents necessary to do your monthly CPF submission. In fact, you have the option to generate an FTP File that you can upload to the CPF Website. Wherever possible, we recommend using our built-in items as they may have special tax treatment attached to them. However, if necessary, you can create custom items by clicking on Settings > Custom Items > Add. When an employee leaves the company, or if you want to remove them for any other reason, you will need to end their service. This has to be done individually for each employee. SimplePay generates GIRO files that can be uploaded into any of the major banks’ online banking platforms, which enables you to pay all of your employees in one go with ease. However, you will first need to complete your company’s bank details. Please note that these settings are purely for the purpose of generating GIRO files to pay your employees and have no bearing whatsoever on how you pay your SimplePay invoices.